Why Use Branded Promotional Products For Your Business? Every day we are bombarded by advertising everywhere we go. Branded promotional product items are quite often thought of as a gift rather than straight advertising, therefore can cut through the clutter. 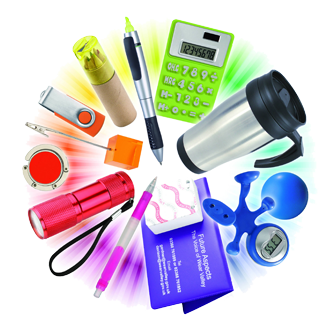 Step foot in any office and you will no doubt find more than one promotional item in use. That’s the fantastic thing about branded promotional products, people not only hang onto branded goods, they use them on a daily basis. That gets your brand seen regularly and repetition builds brand awareness that would cost many times more by any other method. Branded Promotional Products are Effective. Consumers retain promo products for over six months. Over 50% of those consumers use the products at least once a week. Less than 20% of people will trash a branded promotional product. Over 90% of consumers have a branded promotional product at home or in the office. Useful promo items are kept the longest and often passed on to others. Pens are the most used promotional item. Branded promotional products can be used to reward good clients, say thank you or sorry as the need arises. They are especially great as an ice breaker when cold calling. Offer a promo item to any business and they will rarely reject it. Never underestimate the importance of promotional products in your own business. Every item you give to a client should have your brand on it in some form or other wherever possible. Always use your own branded bags, boxes and stickers. Apparel in the form of uniforms, t-shirts and baseball caps are always popular. Fridge magnets tend to hang around the kitchen for a long time and can be very useful. The more useful your promo items are to the client, the longer they will be used and therefore your brand will be front of mind for longer. Promotional products are very cost effective especially if you consider their longevity. Items like pens can cost less than $1 each and hang around for over 6 months. Even USB drives are only a few dollars each and very useful, so retained longer and used over & over again. Sporting goods such as golf balls are very much sought after and very cost effective. Even back packs, tote bags and umbrellas can be branded at economical rates. Drinkware like coffee mugs are in every office. Why not have your brand seen several times a day. Repetition is the best form of advertising. They say that your brand has to be seen at least 7 times to become memorable. What better way to achieve that than with a promotional item sitting on the desk, table or fridge of every home and business in your area? Branded promotional products such as calendars and fridge magnets can even be delivered to every household with a standard letterbox delivery -making them a very cost effective means to create awareness in a large area at an economical rate. Why use branded promotional products? Because they are the best bang for buck advertising there is. Everyone loves to get them. Everyone hangs on to them and everyone uses them on almost a daily basis. Here at Agility Print we are providing promotional products and office supplies for businesses on a daily basis, so why not contact us to start working on your brand awareness?